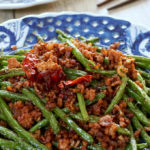 Today’s recipe is a guest post from Mdam Ong – a veteran home cook and grandmother of five. 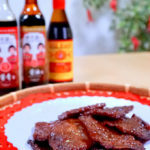 Mdam Ong previously contributed her recipe for Assam Pork Belly (watch video here) which proved a hit with many readers – because it truly addictive and SO simple to make! Today, Mdam Ong is back to share with us a beloved family recipe passed down from her late mother – Hokkien Braised Duck. Once the preparation work is done, the actual braising requires minimal supervision, freeing you up to catch up on other errands. This is a perfect Make-Ahead dish for working mums (and dads!) 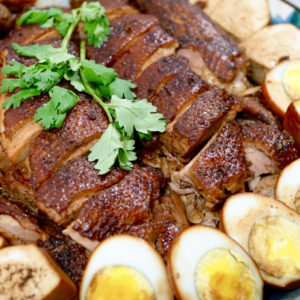 Braised duck tastes even better overnight as the gravy gets soaked up by the duck, tau kwa, tau pok and eggs. Simply refrigerate once it is cool, and reheat in minutes the next day! 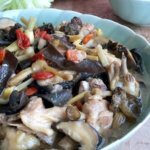 BRAISED DUCK – A TEOCHEW OR HOKKIEN TRADITION? 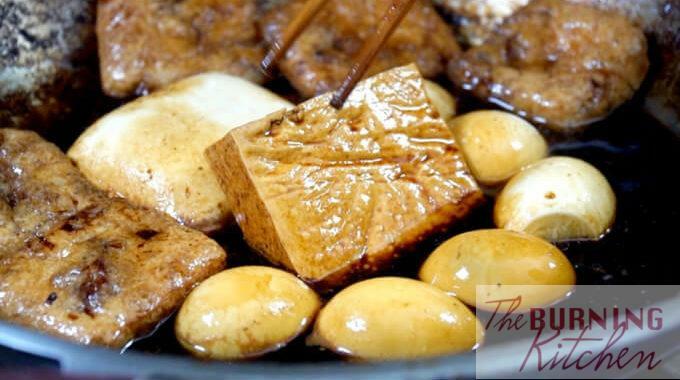 Most people tend to associate braised duck with the Teochews. However Mdam Ong tells me that braised duck also traditionally eaten in many Hokkien families like her own. 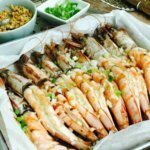 Singapore is a melting pot of a cornucopia of different cuisines which borrow heavily from each other. 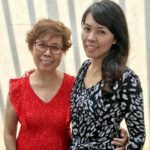 So it is hard to pinpoint the exact difference between the Hokkien and Teochew versions, or which is more ‘authentic’. 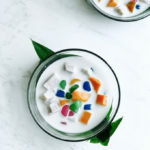 But Mdam Ong tells me that in general, the Teochew version is darker-coloured and more savoury, while the Hokkien version is lighter and sweeter. Indeed, Mdam Ong’s braised duck is more on the sweet side but nicely balanced by some savoury tones. Some Hokkien Braised Duck stalls make this dish with a thickened gravy, but Mdam Ong prefers to make this the way her mother did. 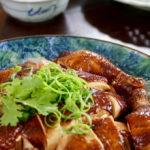 No starch is added to the gravy, apart than the slight natural thickening effect as the fats and collagen from the duck dissolve into the sauce during braising. Clean the duck thoroughly (see tips), then blanch it for a few minutes in a wok of boiling water. Remove any remnant feathers. Rub all over with coarse salt, then rinse thoroughly. 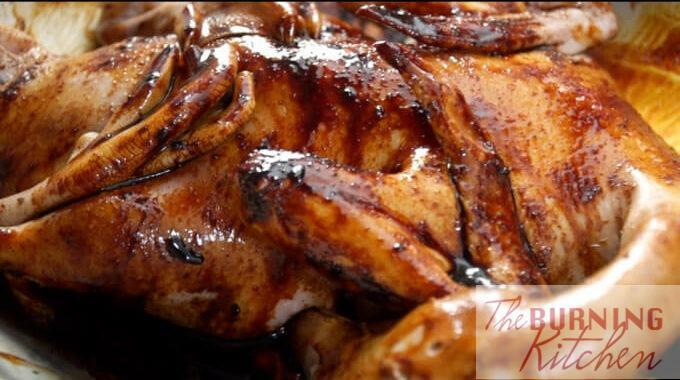 Pat dry and rub each of the marinade ingredients all over the duck as well as in the cavity of the duck. Tuck in the wings and webs of the duck, then allow to marinate for 1-2 hours, or preferably overnight. Wash, peel and slice the ginger and blue ginger (galangal). Then peel and wash the garlic. Stuff the ginger, blue ginger and garlic into the cavity of the duck. 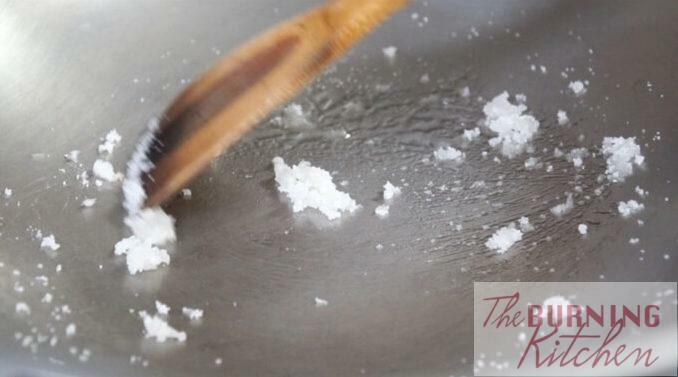 Add the sugar to the wok and fry over low heat until it melts. 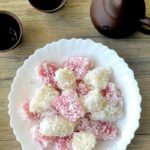 Once the sugar turns golden, quickly add in the 5-spice powder, star anise, cloves and cinnamon stick and fry for 30 seconds. Then add in the dark soy sauce. Next, place the whole duck in the wok and coat it evenly with the soy sauce mixture. Add in 1.5 litres of water until the water covers the duck to around three-quarter, and add in the rock sugar. Bring back to a boil over high heat. Once boiling, turn the heat down to medium and braise the duck uncovered for 1.5 hours, turning the duck over mid-way. Turn the duck a few times towards the last 30 mins to ensure the bottom of the duck is not burnt as the sauce thickens. Transfer the duck to a plate. Next, use the same braising gravy to braise the tau kwa, tau pok and hard boiled eggs for about 30 minutes. 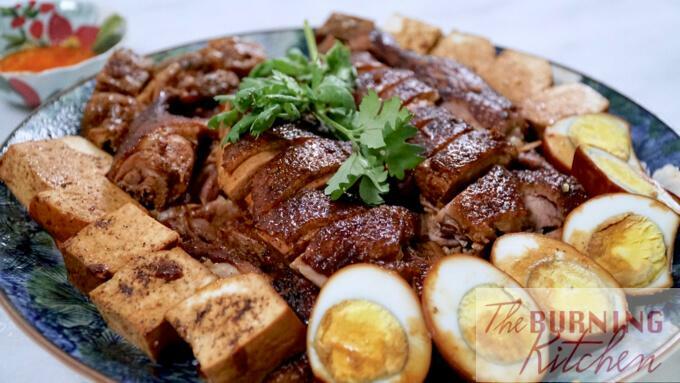 Chop up the duck and place on a serving dish, together with the firm bean curd (tau kwa), dried beancurd puff (tau pok) and hard boiled eggs. 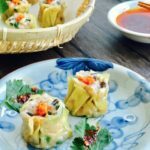 Garnish with parsley, and serve with the chilli sauce and steamed rice. To test if the duck is cooked, use a chopstick to poke through the thickest part of the duck (usually the thigh). Braise the duck in an uncovered wok – this achieves a slow-cooking effect that helps the meat to achieve a more tender and moist texture. Slow-cooking also allows the duck to soak up more flavours from the sauce, compared to if the duck has been cooked more quickly over a high fire. To further mask the smell of the duck, this dish is typically cooked with ingredients such as yellow ginger, blue ginger, garlic, cinnamon, star anise and cloves. Best to marinate the duck overnight to allow the flavours to penetrate the meat. If you are in a hurry, let the duck to marinate for at least 1-2 hours to allow the flavours to seep in. Duck meat, if not properly prepared, can be very ‘fowl’ smelling. To get rid of the odour, you need to make sure that the duck is cleaned very thoroughly. 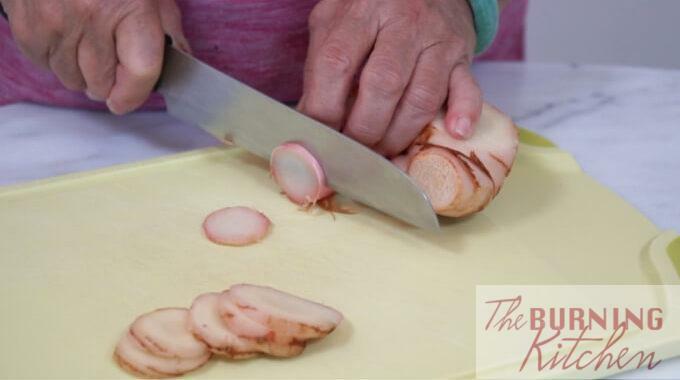 Remove the thick layer of skin over the tongue and bill of the duck. 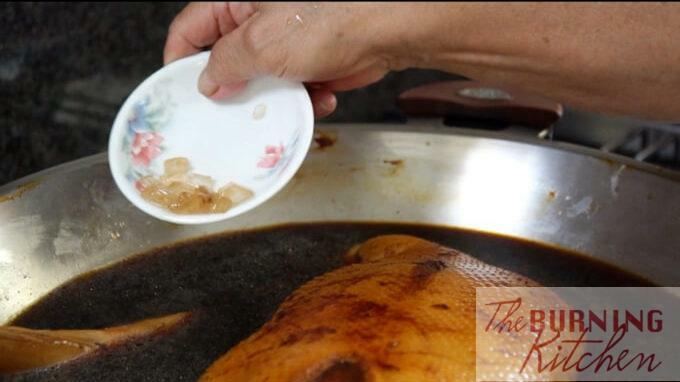 Remove the oil glands from the duck tail, and it can be very smelly. These 2 oil glands are yellow coloured and are located in the top half of the duck’s hind. Alternatively, you can simply cut off the whole tail-end of the duck if you prefer. Remove the windpipe located in the duck’s neck, if you enjoy eating duck neck. Remove the callouses on the bottom of the duck webs, if you enjoy eating duck web. Peel and wash the garlic, then chop coarsely. Remove the seeds from the chilli and rinse. Cut into small pieces and blend finely. Place the chilli and garlic in a bowl. Then add in the vinegar and sugar and mix well. Mdam Ong's treasured family recipe for Hokkien Braised Duck was passed down by her mum. 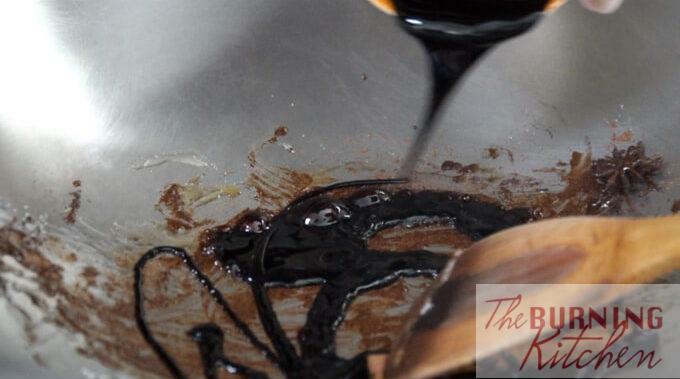 Find out her secrets to removing the duck's oil glands and why she never covers the wok. Clean the duck thoroughly include all innards in the duck cavity (see tip 1). Then blanch the duck for a few minutes in a wok of boiling water. Remove any remnant feathers. Rub all over with coarse salt, then rinse thoroughly. 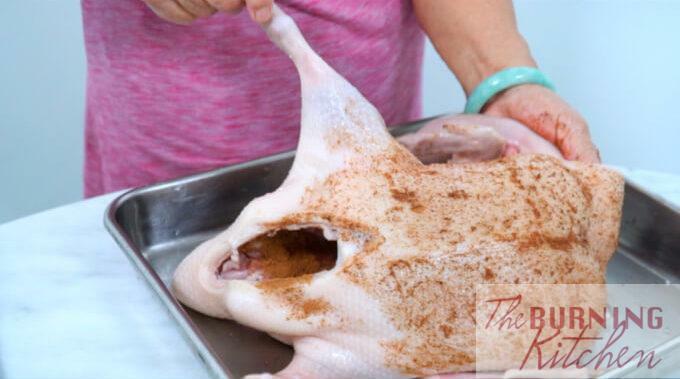 Pat dry and rub each of the marinade ingredients all over the duck and in the duck cavity. Tuck in the duck wings and webs, then marinate overnight (or at least for 1-2 hours). Wash, peel and slice the ginger and blue ginger. Then wash and peel the garlic. Stuff the blue ginger and garlic into the cavity of the duck. Once the sugar turns golden, quickly add in the 5-spice powder, star anise, cloves and cinnamon stick and fry for 30 seconds over low heat. Then add in the dark soy sauce. Add in 1.5 litres of water until the water covers the duck to around three-quarter, and add in the rock sugar. Bring back to a boil over high heat. Once boiling, turn the heat down to medium and braise the duck uncovered for 1.5 hours, turning the duck over mid-way. Turn the duck a few times towards the last 30 mins to ensure the bottom of the duck is not burnt as the sauce thickens. Transfer the duck to a plate. Then use the same braising gravy to braise the tau kwa, tau pok and hard boiled eggs for about 30 minutes. 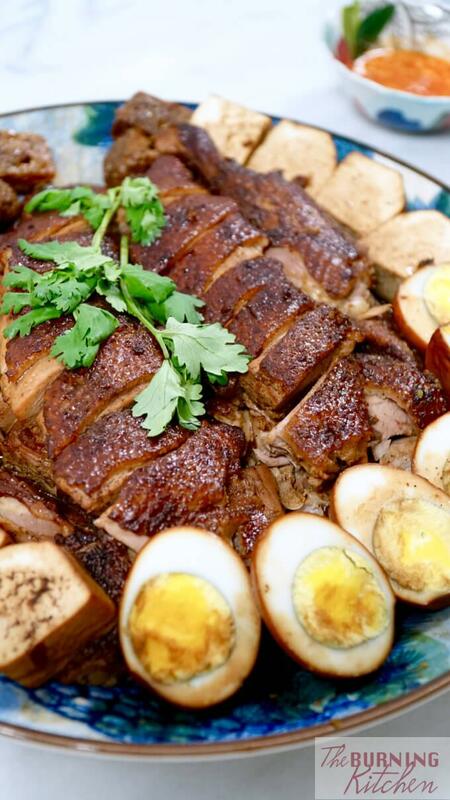 Chop up the duck and place on a serving dish, together with the tau kwa, tau pok and hard boiled eggs. 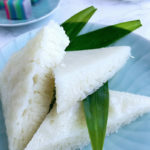 Garnish with parsley, and serve with the chilli sauce and steamed rice. To test if the duck is cooked, use a chopstick to poke through the thickest part of the duck (usually the thigh). 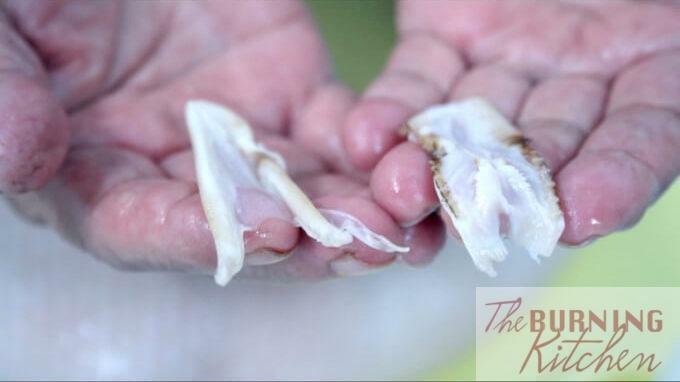 Another way is that once the skin at the joint of the wings and leg are torn, it's cooked. Braise the duck in an uncovered wok - this achieves a slow-cooking effect that helps the meat to achieve a more tender and moist texture. Slow-cooking also allows the duck to soak up more flavours from the sauce, compared to if the duck has been cooked more quickly over a high fire. 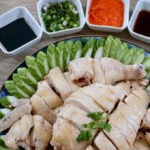 To further mask the smell of the duck, this dish is typically cooked with ingredients such as ginger, blue ginger, garlic, cinnamon, star anise and cloves. Blue ginger is a must for more flavour. Duck meat, if not properly prepared, can be very 'fowl' smelling. To get rid of the odour, you need to make sure that the duck is cleaned very thoroughly. Remove the oil glands from the duck tail, and it can be very smelly. These 2 oil glands are yellow coloured and are located in the top half of the duck's hind. Alternatively, you can simply cut off the whole tail-end of the duck. Remove the windpipe located in the duck's neck, if you enjoy eating duck neck.